Get XL vision without compromising fit when you toss on the Oakley Factory Pilot Collection O2 XL Goggles. The flexible O Matter® chassis conforms to your face for a perfect fit while all day comfort is brought to you via moisture-wicking triple-layer polar fleece face foam. What in the world could make these any better? How about frame notches at the temples that provide compatibility with most prescription eye wear? O Matter® Chassis  Flexible O Matter® frame conforms to your face and remains flexible even in extreme cold. All-Day Comfort  Oakley goggles are developed with 3D CAD/CAM engineering to ensure anatomical fit. They provide a continuous seal to lock out elements and wick moisture away from the face. 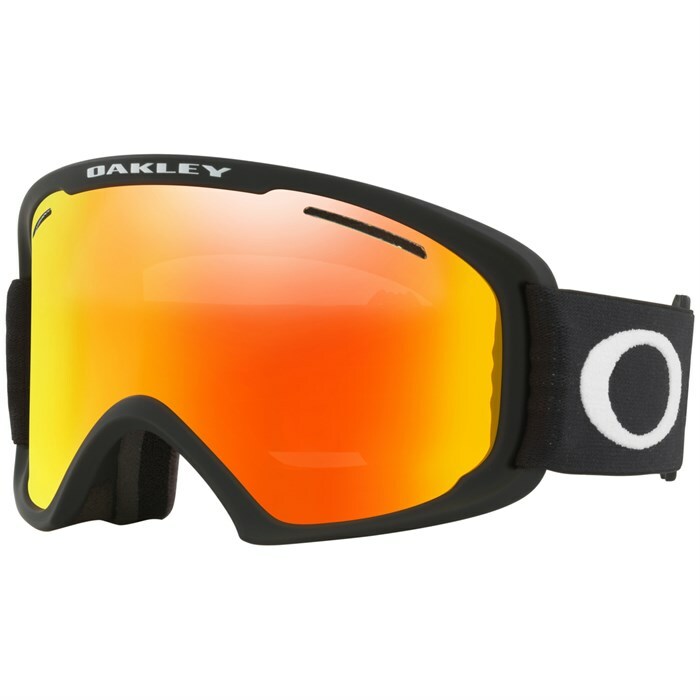 Helmet Compatibility  Oakley snow goggles are designed to work in harmony with a wide range of helmet styles, with outrigger mounts that distribute pressure evenly across the goggle chassis and silicone beaded inner straps that stay securely in place. 360˚ frame venting assures optimum airflow when worn with a helmet. Discreet frame notches at temples provide compatibility with most prescription eye wear, without compromising fit. HDO® Lens Technology  HDO® maximizes clarity and impact resistance, and gives you razor sharp clarity at all angles of view. HDO® lenses provide 100% UV filtering and the best impact resistance in the business. Anti Fog  Dual vented Plutonite® lenses with F3™ coating, which allows the inner ballistic lens to absorb a minimum of 2 ml of moisture. Large Lens Design  Expands peripheral view in every direction. Dual Vented Lenses  Dual vents and F3™ anti-fog coating keep your vision crystal clear. Moto-Style  Moto-style strap attachments provide helmet compatibility. Silicone-Backed Strap  Non-slip strap keeps your goggles in place even on slippery helmet surfaces. Triple Layer Polar Fleece Foam  Moisture wicking triple-layer polar fleece foam assures all-day comfort.